The annual F2 Summit was held on September 18 and 19 in Boulder. The two-day event was an opportunity for F2 Advisory Board firms to gather and discuss the future of the initiative. 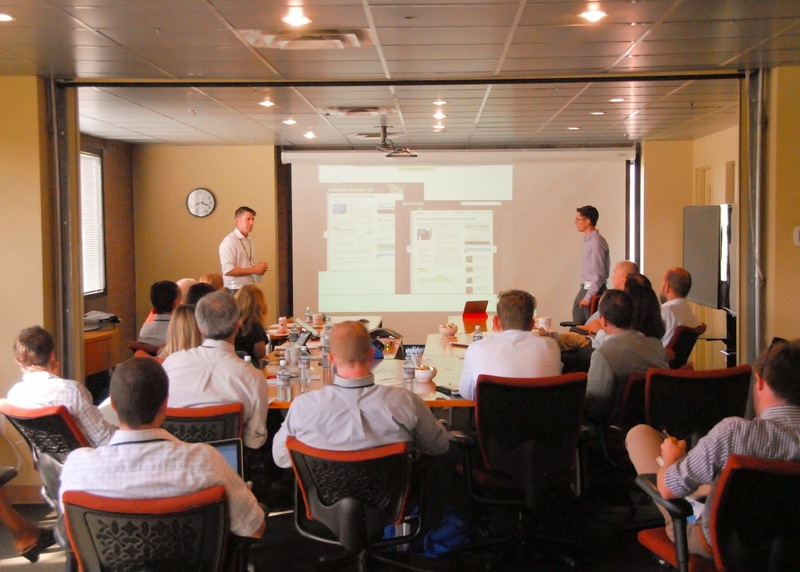 The agenda was packed with presentations, demos and roundtable discussions. Of course we couldn’t miss the opportunity for a happy hour as well as a hike on the historic Chautauqua trails. 10 of the 14 Advisory Board firms sent representatives to the Summit, with most firms sending two individuals. The following firms attended (in alphabetical order): Markit, Moody’s Analytics, Morningstar, Pershing, RBC, S&P CapitalIQ, TD Ameritrade, TIAA-CREF, USA Today and Wells Fargo. Throughout the two-day Summit—from talking through the vision of F2 to exploring governance —these objectives were achieved or at least moved forward. There will be more information forthcoming on the official governance model as the F2 Team works with the Board to document it. On the afternoon of Day 1, representatives of TD Ameritrade and USA Today gave presentations of their firms’ production F2 implementations. These demonstrated not only the viability of F2, but also the flexibility of the framework to span across retail brokerage and into media. The focus of Day 2 was aligned with the overall theme of the Summit: the evolution of F2. In the morning sessions, we covered various types of contributions to the initiative as well as governance models. 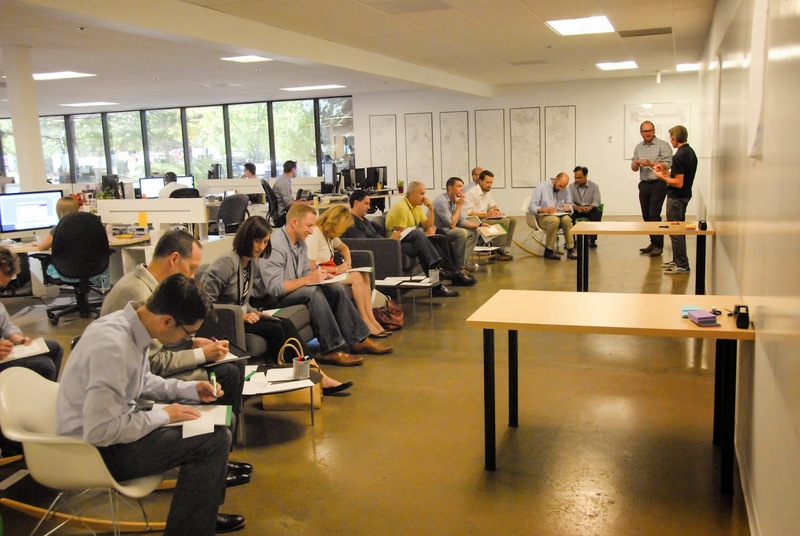 After lunch, the Board moved across Markit’s Boulder campus to participate in an interactive brainstorm in the Design space. 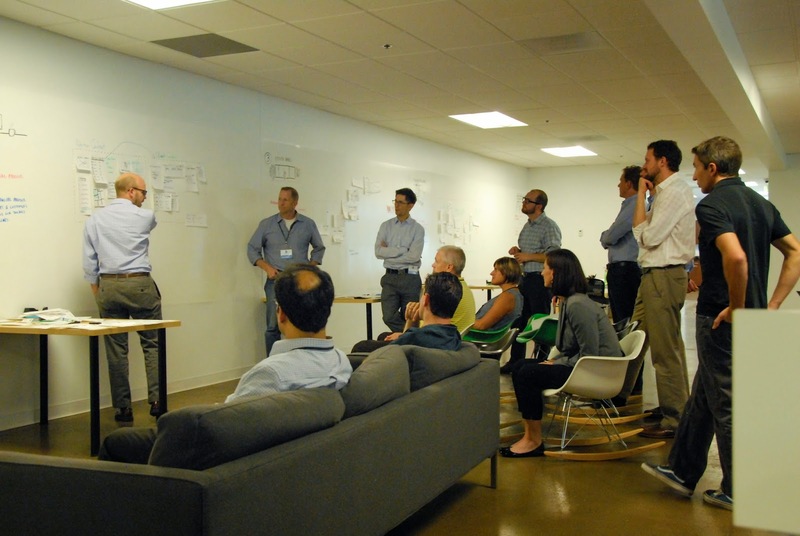 The purpose of the brainstorm, held in front of a 50-foot-long whiteboard, was to be creative with F2 and demonstrate how F2 Apps can be repurposed for almost any user experience. Divided into teams, the Board created F2 Apps out of paper rectangles and markers, then placed those Apps on 4 different delivery channels: desktop, iPad, large touch-screen displays, and a billboard in Times Square. The 2014 Summit was incredibly successful. A huge thank you to Markit for hosting the second annual event and especially for the delicious Boulder-made chocolate. The core F2 Team is grateful to all of those who traveled to Boulder and participated in meaningful, thoughtful and candid conversations. There is much work to be done, and with the continued involvement and contributions from the Advisory Board, the future of F2 is bright. The Summit notes are available in PDF. When F2 was originally released in 2012, Bootstrap was still a Twitter project. Since then, much has changed and, of course, F2 still uses Bootstrap. We've heard some questions about Bootstrap 3 support recently and wanted to clear up any confusion. The currently-supported version of Bootstrap in F2 is 2.3.2. This means Container and App Providers should expect Bootstrap 2 code conventions, including functioning F2.UI.Modals. However we've seen and heard about recent implementations where Modals have not been required in the solution thus leaving the door open for separate parties to mutually agree on using Bootstrap 3 code conventions for more "modern" development. In fact, we've done this ourselves on the new F2 website! To make this point even more clear, no F2 code needs to be modified to use Bootstrap 3 today. Simply get the F2.no-bootstrap.js custom build of F2.js, understand you won't be able to use Modals, and push all involved parties to agree on the Bootstrap 3 styleguide. This is a temporary solution as there's an open Pull Request to officially upgrade to Bootstrap 3 in F2 1.4. You can visit #142 for all the details. Any questions or concerns? Get in touch with us. The F2 Team is happy to announce the upcoming F2 Summit to be held in Boulder, Colorado on September 17 and 18, 2014. This second annual event is an opportunity for F2 Advisory Board firms to gather and discuss the future of the initiative. The theme for this year's Summit is “The Evolution of F2.” The agenda for the day and a half event will include presentations on F2’s roadmap, panels showcasing F2 in production websites, and discussions around governing the open source initiative. We are looking forward to welcoming both builders and non-builders alike from all of the F2 Advisory Board firms to this year’s Summit. We’ll be sure to post more information before and after the Summit in September, stay tuned! 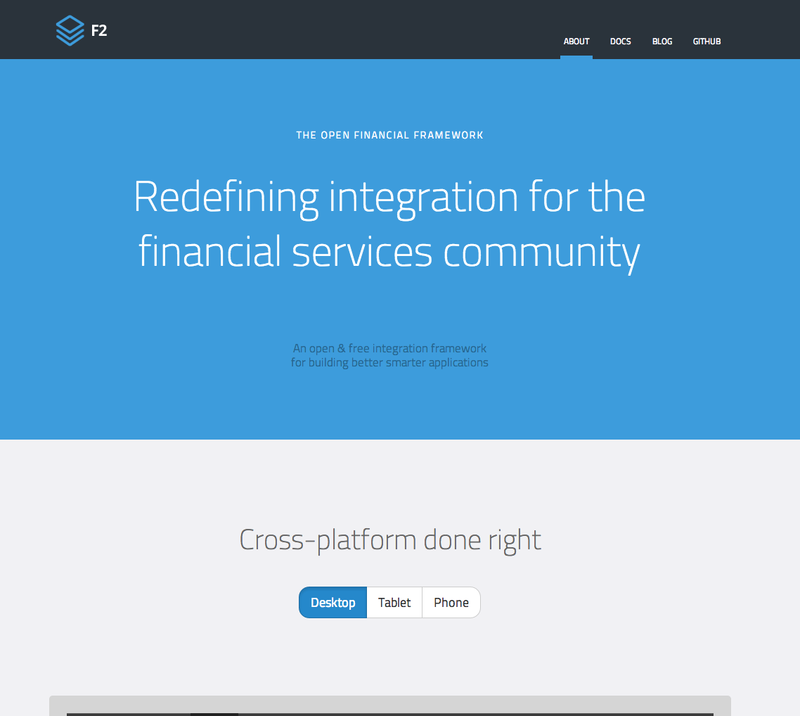 Our work on the complete redesign of the F2 website is complete and it is now live! The new design represents a fantastic refresh of both the visuals and presentation of information across the site. Beyond the look and feel, the amazing design team have reimagined the framework's identity by creating a new logo mark for F2. The website, hosted at the same address OpenF2.org, launched at the end of July. From the top of the home page all the way to the bottom, the flow of information provides deeper insight into what F2 is, how it works, who it's for, and what its benefits are. Additionally, the content aligns much more closely with the printed collateral for more unified materials. The Advisory Board firms' logos are represented on the site identifying the influential companies who support the F2 initiative. Finally, in response to feedback, we have a much more robust Hello World demo linked in the feature carousel. Throughout the rest of 2014 the F2 team will be working to refresh the design of the F2 website stretching across into the F2 spec itself (docs.openf2.org) and this blog. We would like to thank the Advisory Board members who participated in early design reviews for their valuable feedback and contributions. Visit www.openF2.org and let us know if you have any feedback. Today we are thrilled to announce a new open source project, an iOS app featuring an F2 Container. Since launching F2, we've had countless conversations about taking advantage of the framework across all devices and platforms. App reusability is core to F2 and extending that reuse to mobile platforms is an important part of building modern applications with F2. We've used this iOS Container demo app to proof of concept two primary things: the loading of F2 apps and the communication between them (i.e., F2 Context). The iOS app demonstrates how quickly and easily F2 apps can be integrated in a native environment with the communication layer remaining intact. Let's break it down. As you can see in the screenshot below, we're loading four F2 example apps in a single view. These are the same example apps used on OpenF2.org and included in the Examples download. No changes were made to these apps to support iOS integration. If you look closely, notice the little blue "i" in the bottom right corner. 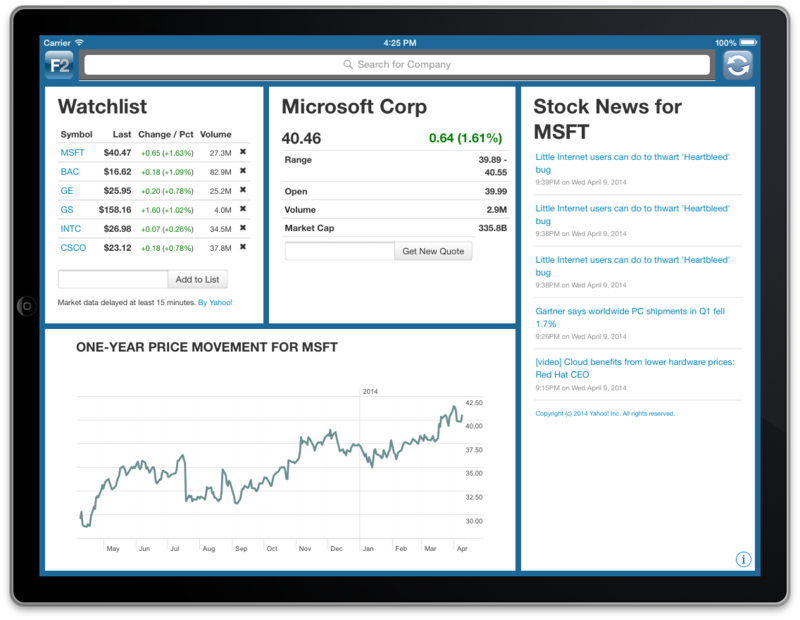 When tapping that button, the Stock News app flips over and you're able to either choose between Stock or Market News, or to provide your own F2 AppManifest for no-code-changes-required demos. This app currently only supports iOS 7 and iPad in landscape orientation. Apple doesn't permit ad hoc betas or trials through the App Store, so if you want to install this on your iPad, you'll need to get the source from GitHub into Xcode. If you wanted to replace all of the UIWebViews with your own apps, replacing them is as simple as providing an AppConfig like this for the watchlist app. Just like F2, anyone is free to download this project. The same license applies to iOS Container—Apache v2 and © Copyright 2014 Markit On Demand. Browse over to the GitHub project—OpenF2/iOS-Container—for all the source code, docs, and the app itself. The F2 Team would welcome any Pull Requests or Issues on this demo iOS app, and you can reach us at info@openf2.org for specific questions. This release adds support for overriding the app dependency loading mechanism inside F2.js. We heard feedback that occasionally Container Developers need more granular control over the request mechanism in F2.js for AppManifest-defined dependencies. The current dependency request process is handled by the straightforward createElement('script') and createStyleSheet() statements for scripts and styles, respectively. In version 1.3.3 of F2, the app dependency request can be overridden in the ContainerConfig. Read more about this in the Docs. Any questions, concerns, or bug reports, submit an Issue on GitHub. Version 1.3.3 is available for download (zip) from GitHub.